Bluebell Wedding Stationery offers excellent value for money on a high quality extensive range of stationery, mass booklets, DIY supplies and accessory products. 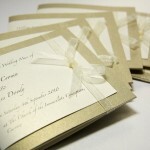 We offer a personal service in the creation of your wedding stationery. We can We pride ourselves on committing fully to every client, which means working with you until you are entirely satisfied. 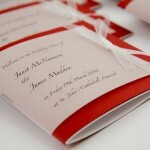 Bluebell Wedding Stationery is managed by Tara Hickson, who has over 15 years experience as a graphic designer. In recent years Bluebell has worked with a large number of couples in the creation of their wedding stationery and mass booklets. Tara uses this experience to work with and design for each individual couple. Her creative vision and attention to detail delivers stationery that is hand crafted and is defined by a unique integration of art, craft and graphic design. Bluebell offers a full wedding print service, we can work with you to deliver all of your stationery requirements for your wedding. We also design table plans. 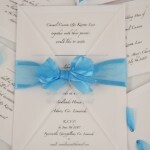 In addition to the basic stationery reuirements, Bluebell can offer you a comprehensive booklet service. We design and print an extensive range of mass booklets and leaflets and can cater for all budgets and tastes. We do not charge a design or setup fee for any of our work and are prepared to work with you to offer a full service or assist you if you would like to create some of your stationery etc yourself. Please note, our product catalog consists of a selection our work. We have a complete set of stationery range if you wish to partner with us for your stationery needs. We hope that you find our site informational. Please feel free to contact us to discuss your plans further.